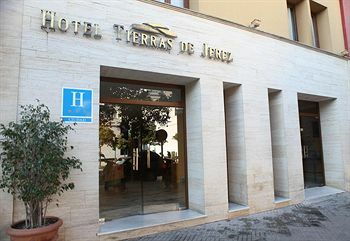 The Hotel Tierras de Jerez was inaugurated is situated in the Plaza de las Angustias, an important area within the historic center of Jerez de la Frontera. 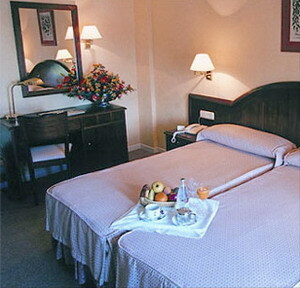 The hotel is surrounded by emblematic monuments namely the Alcázar (Castle) and the Cathedral. 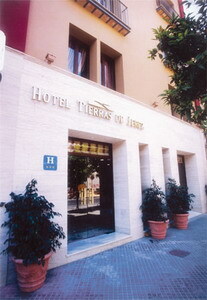 The hotel is situated in the most exclusive area of the city with its commerce and fine restaurants and near to tourist sights such as the museums and 'bodegas' (wine and sherry cellars). Breakfast lounge: here you find an abundant breakfast buffet, or, if you wish so, you can also order a “Continental” breakfast to be served in your room. 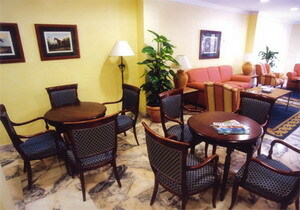 Bar-Cafeteria: In the Entrance lounge of the Hotel there is a meeting place with cafeteria service. Room Service: Includes coffee, tea, drinks, snacks and simple dishes. Open Air Solar Terrace: Here you can relax and enjoy the magnificent climate of Jerez. The Hotel has its own car park; a public parking is nearby. The Hotel offers the following facilities: Fax service, laundry, reservation service for city tours, shows and events (see also the link “Activities”) and a car rental service. 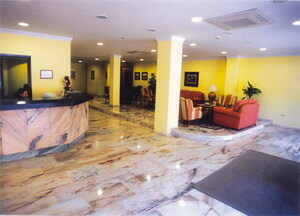 There is a wireless Internet connection (WIFI) in the Hotel Reception area, the Cafeteria and in several rooms. 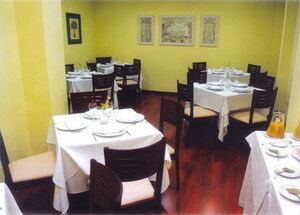 The hotel has a meeting and conference room with a capacity of up to 15 persons, depending on the the arrangement. Renting of audio and video equipment is possible. The Hotel has 50 rooms (1 double with extra room, 5 double rooms with master-bed, 32 double rooms with separated beds and 12 single rooms). They are furnished in classical decor, all with fully equipped bathrooms, including hair dryer, air conditioning, mini bar, safe deposit box, SAT-TV and telephone. Some rooms have their own balcony or terrace with garden-style furniture. In the course of history, Jerez has been an enclave strongly influenced by the different cultures that setteled there, a fact that is visible through numerous historical remains in the city as well as in its surroundings. The traces of the Phoenician Xerez, the strongly Roman influenced Ceret, the important moslem Sherish as well as the outstanding Christian constructions of later times form a wide range of architectural styles and outstanding buildings which make Jerez a precious city with a real special urban appearance. Very few places in Spain have such an international reputation as Jerez. Due to its wine, namely Jerez or Sherry, the name of our city became famous a long time ago and surpassing frontiers, it became universal. Jerez is not only its wine or only the architecture of singular buildings, Jerez offers much more to everbody: it is also the home of Cartujan Horses, the fighting bulls, the cradle of the art of Flamenco, the city of motor sports and big events.It has been declared as a centre of historic and artistic interest. Nowadays Jerez is a big city where tradition lives together in perfect harmony with actual modernity: Big malls and avenues join the lively historic centre where shopping and enjoying snacks go hand in hand. All these different characteristics, as well as its extraordinary geographic situation and climate and the unique and distinctive tourist attractions, make Jerez a perfect choice for living and visiting. Jerez presents itself to all travellers, visitors and tourists as a very attractive city. It is easy to explore because of its dimension, although it is the fifth biggest city in Andalusia according to its inhabitants. It is a great oportunity and advantage to walk through the widely spread pedestrian zones and enjoy at the same time the historic and artistic center of the city. At the Hotel Reception you will find information about the diverse activities which help you to get in touch with our culture. Flamenco: Every day there are live Flamenco Shows apart from numerous festivals and special concerts during the course of the year. It is important to mention the 'Centro Andaluz de Flamenco' (Andalusian Centre of Flamenco) with its specialized book and audio library. 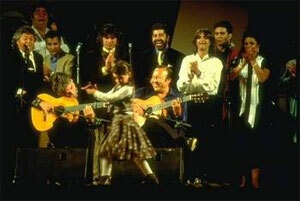 There are also a number of Flamenco schools, some of them combined with Spanish Language Courses for foreigners. 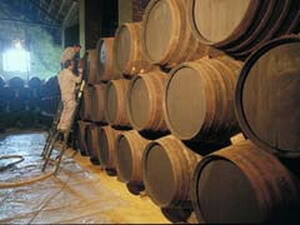 Wine: Jerez is known worldwide for its wine, the 'Jerez'. The reason for this globaly unique product lies in its geographical situation, its privileged climate, the soil where the wineyards are cultivated, as well as the variety of the grape and, last not least, in the special seasoning of the wine. Some of the best and most famous 'bodegas' (wine cellars) of Jerez are located at a short distance from the Hotel, namely González Byass (Tio Pepe), Sandeman, Domecq, Harveys, etc. Horses: Every Tuesday and Thursday at the 'Real Escuela de Arte Ecuestre' (Royal School of Equestrian Art) you can enjoy the presentation 'Como Bailan los Caballos Andaluces' (The Dance of Andalusian Horses). 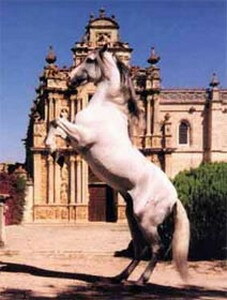 This show is considered to be one of the best equestrian presentations worldwide and is of course one of the major tourist attractions of Jerez. On Monday, Wednesday and Friday you can see the training and preparation of the show and visit the rest of the building, including the Museum of Equestrian Art. On Saturday you can visit the 'Yegüada de la Cartuja' (horse-breeders), the biggest and most important centre of Carthusian horses of pure Andalusian blood. Sites of tourist interest: The Cathedral, the Alcázar (castle), the Cámara Oscura and Churches, namely the Iglesias de San Miguel, Santiago y San Marcos amongst others; the Cartuja de Santa Maria (Monastery), the Museo Arqueológico (Arqueological Museum), the Centro Temático La Atalaya - a fantastic theme complex connected with the 'Museo del Misterio de Jerez' (The Mystery Museum of Jerez, showing the creation and elaboration of Jerez' wines) and the 'Museo del Tiempo' (The Time Museum, which has one of the major clock collections worldwide), the Museo del Enganche and the Museo Taurino ( bull fighting). You can also take the Tourist Bus or join guided city sightseeing tours (individually guided tours or in groups). Another outstanding event of Jerez is the 'Semana Santa', the Easter week, with its most beautiful processions of great tradition. During this week you can fully enjoy all attractions of Jerez. Sports: The motor speedway of Jerez, where the World Championship of Motorcycles and other motor race events take place. The Stadium 'Olimpico Chapín', home stadium of the local soccer team 'Xerez C.D.' where also athletic or equestrian events take place. 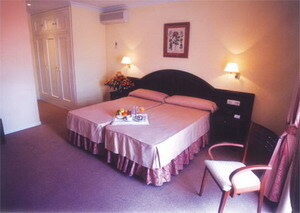 Also to mention the two Golf Courses of Jerez, the Sherry Golf and the Montecastillo Golf. You will find other excellent Golf Courses in the nearby region, such as the Villanueva Golf Resort, the Costa Ballena Golf, the Vistahermosa Golf, the Novo Sancti Petri Golf, the Valderrama Golf or the San Roque Golf Club. Please contact our Reception personnel to get special-price entrance tickets. Gastronomy: Nearby the Hotel you can find not only a multitude of bars and taverns where you can enjoy snacks but also some of the finest restaurants of the city. Don't miss tasting the exquisite local specialities, finished with consommés of the region, nor the excellent fish from the bay. The local fairs, like the very unique 'Feria de Caballo' (horse fair) in the month of May or the 'Feria de la Vendimia' (grape harvest fair) will also be unforgettable events. Possible activities nearby: The zoo of Jerez, the aquatic park 'Aqualand' (only in summer), excursions on horseback, rural tourism in the nearby 'Sierra' or a visit to the 'White Villages' (Pueblos Blancos). We also recommend the beautiful beaches of the Cadiz province where you can practice water sports or horseback riding. May Horse Fair Grounds 1,5 Kms.